Below you will find a number of resources for building your own custom controller. It’s free… motivated individuals can find these resources on their own. Sharing this information only provides access. It doesn’t replace the skill required to actually build a controller. Do It Yourself controllers are not like DIY car repairs or DIY computer builds. If you were to build a controller to match the feature set of a commercially available controller, you will spend 50-300% more (in parts alone) than buying off-the-shelf. Unless you own and operate a factory assembly line, you cannot compete on price with mass-market electronics producers. DIY builders do it for customization, control and experience. They don’t build to save money. Every controller is made of three parts. Brain: The core electronics behind your controller. All your buttons, knobs and switches connect to this device. Components: Buttons, knobs, switches, lights, wire, plugs, etc. Enclosure: The container which will hold the brain and your components. For purposes of making a controller, the category of electronics to look for are called “voltage to MIDI converters.” These are devices that take the signals sent by knobs, buttons and switches, and convert them to MIDI signals. There are electronics that do the opposite. They convert a MIDI signal into flashes of light, or turns of a motor. There are electronics that do both in a single device. MIDI is the primary music communication protocol for controllers. It’s over twenty years old, it uses weird cable connectors, and honestly, it’s a bit slow. But it’s the only standard the entire music industry has agreed to use. Efforts have been made to establish new controller standards, but all have failed. Fortunately, many MIDI brains now incorporate a MIDI-to-USB converter, offering the convenience of USB to the MIDI world. These devices eliminate the need for MIDI and power cables. Most of these newer brains are programmable, with free software provided by their creators. Dieter Doepfer makes MIDI brains at his namesake company, but is better known for his modular analog synthesizers. Doepfer were one of the original manufacturers of controller brains, and their products have a solid reputation. Hale Micro is one of the newer manufacturers of MIDI brains. Run by former House/Techno producer Kenneth Graham, Hale Micro boards are compact and highly customizable. Kenneth himself is an active, helpful and friendly participant on his own tech support forums. Arduino is less a MIDI controller brain, and more an open platform for any imaginable type of physical computing. Arduino can be programmed to speak MIDI. In addition, people have built Arduino-based products specifically for MIDI (here and here). Highly Liquid also makes a MIDI brain. The brain they offer seems to offer quite a bit of value for the price. Note the lack of “headers.” There’s no easy way to attach wires to the board until you purchase some parts and solder them on. A cursory glance at the Highly Liquid forum seems to indicate that like Hale Micro, the proprietor is an active, helpful technical resource. Livid Instruments are an Austin, Texas-based company that make beautiful controllers for video and music performance. They have opened their electronics to the DIY community. Their MIDI brain is packed with an amazing amount of features. In addition, they have developed product lines, videos and classes specifically to aid in controller building. The MidiTron is yet another series of MIDI brains. Offered by Eric Singer, these brains were some of the earliest pre-made brains in existence. No list of MIDI brains is complete without mention of the MIDIBox project. Torsten Klose’s brainchild has spawned a number of innovative controllers. The focus of MIDIBox lies in experimentation, education and the general DIY aesthetic, NOT in making money. They encourage the use of their electronics for personal projects, and discourage the use of their projects for profit. One final note on brains: IF you only desire buttons/switches in your controller and IF your software can accept key commands, you have another solution with keyboard brains (as in, typing keyboard) instead of MIDI brains. There is a cottage industry of these brains (catering to the DIY video arcade community) that offers their own products. Two companies to start your search include Ultimarc and Hagstrom Electronics. Components encompass every thing that isn’t the brain or the container for the controller. That’s a lot of parts. The components with the greatest potential for confusion are the ones that connect to the brain (knobs, sliders and buttons; ie: “sensors”). More detail about these below. Each brain behaves in its own way, but the general practice behind connecting components is the same. The brain wants three wires hooked up to every button, knob or slider. One wire is for power. One wire is a ‘ground’ connection. The last wire represents the signal itself. Your job is to identify which wires go where, and to build a configuration to match. This can be harder than it appears. A solderless breadboard and jumper wires can come in very handy here. Only when digging into parts catalogs can you comprehend the dizzying variety of configurations out there. Here’s a short list of tips to help your search. Knobs are called potentiometers – rotary potentiometers to be exact. The word ‘knob’ usually denotes the cap over the knob. 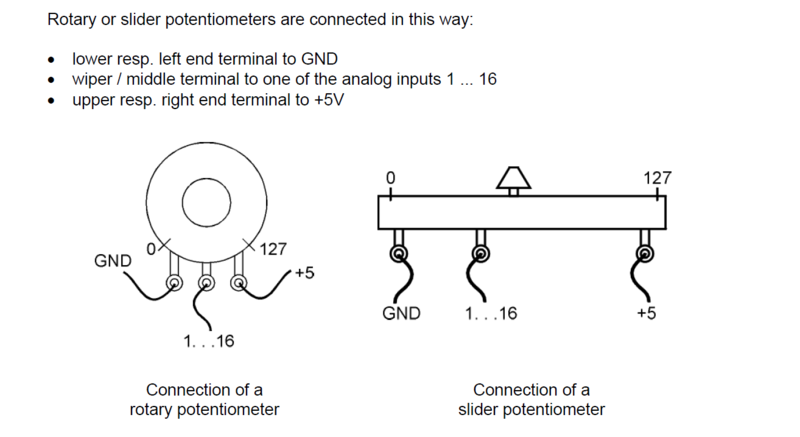 Sliders/Faders are called linear potentiometers. Knob caps come in different sizes to match the various widths and diameters of the potentiometers they attach to. Buttons are lumped in the same category as switches. Their variations lie in their action, their shape and their electrical behavior. A rotary encoder is also considered a switch. Most MIDI brains CANNOT decipher rotary encoder signals. Two Exceptions. “Resistance” of 10,000 (10k) ohms. Is it a narrow pin, suited for printed circuit boards (PCBs) and breadboards? …or is it a solder lug, made for easy connection to wires? Does it panel mount, attaching firmly to a front panel? …or does it PCB mount, requiring a board under the front panel? Speaking of parts catalogs, below is a list of common component resellers. You will find significant overlap in their inventories, but you’ll also discover distributors that may be exclusive carriers for a preferred part. Mouser is a massive distributor that carries just about everything you’ll need. Their website is easy to navigate. They cross-reference exhaustively with their pdf catalog. Digikey has a similar inventory to Mouser. Their website is a bit harder to navigate, though many electronics buffs consider them their favorite distributor. Allied Electronics is not as well known as Digikey or Mouser, but their website is very easy to use, and they have a beautiful catalog. Newark is yet another reseller. They offer some parts not found at any of the above distributors. Sparkfun is a distributor that specializes in DIY projects. Their inventory is not as massive, but it’s been carefully curated to hone in on key components for DIY builders. Note: most of the above distributors will accompany their website product listings with Data Sheets. These technical documents are invaluable, and will aid in identifying parts. At a certain point in your controller-building career, you begin to look at objects in a different light. You start seeing past items, noticing how they are assembled from raw materials, joints, fasteners, hinges, standoffs and brackets. These types of parts become more important as you begin planning the physical configuration of your controller. The holy grail for these items is McMaster Carr. Their products can be pricey, but their website is a thing of beauty and the variety of products they stock is amazing. Your enclosure contains your brain and your components. It can be a shoebox, a custom-designed steel frame, a plastic box from Radio Shack… anything you dream. Some jumping-off points are below. Many component distributors carry enclosures in a variety of shapes, sizes and materials. You will have to drill your own holes, but a ready-made enclosure can save a great deal of time and effort. “Found” enclosures are also a wonderful choice. Keep an eye out for unique housings on eBay, at antique stores or at garage sales. The Briefcase was built from a “found” enclosure. Front Panel Express is a unique company that allows you to build custom panels and enclosures. They facilitate the process through proprietary design software. The software interfaces directly with Front Panel Express and fully incorporates pricing and order processing. The Third Deck is built from Front Panel Express, as is the faceplate for the Briefcase. Protocase operates similarly to Front Panel Express. Each company has capabilities the other does not, so it’s well worth considering both companies if you’re interested in a custom solution. The final option is to make your own enclosure from scratch. If this is not possible, look into local woodworkers and machine shops. DIY-friendly workshop communities are popping up around the world. Search around and you may find a number of like-minded folk. Start by checking out this page. Only one tip, but a big one. Early on, become fully aware of the physical properties of your MIDI brain, your components and your enclosure. Imagine how everything will fit. Try to anticipate problems before you commit to an enclosure that’s too short, or a fader that’s too long. Paper cut-outs are ideal here. Making a controller isn’t rocket science, but like any new discipline, it requires a certain level of determination. “Attention to detail,” that overused Business Buzzword, is a fitting term here. The sheer number of options, coupled with the need to make things work both physically and electrically, can be paralyzing. But with some patience, it is possible. Embrace the “happy accidents” and don’t be afraid to mess up. Instead of becoming paralyzed by choice, take comfort in the fact that such competition exists. Remember that others before you have made numerous mistakes, and are sharing their experiences so you don’t have to endure the same. Note: the owner of 60 Works and Moldover — Controllerist Extraordinare — successfully built their first controllers with no prior formal education in electronics. I have limited experience with their stuff, and no experience with the others you name here (thanks for this blog post — very informative). One think I like about the iCubeX stuff: no soldering. It’s easy to try a bunch of sensors, quickly. Thanks much for taking the time to comment! Thank you for the information. It has helped build the confidence, and the resources I need to make a midi foot controller with membrane type switches (think clicking the top of an open jar of jelly or snapple) that I have always imagined in my mind. Great article, write some more! Great articles on your website! I doubt however that you’ll end up spending 50% to 300% of the price of an off the shelf controller ontop just for parts. Unless you are comparing apples to oranges. When comparing pricings I think you’ll have to compare quality, too. Faders for example. I use Alps 100 mm faders for my controller. Those are high quality faders. I don’t know if any off-the-shelf controller has one of those. Another point is the “repairabilty”. Here again I think it’s unfair to compare a highly integrated device (e.g. Korg nano control) to a modular one. That said, in my experience parts will cost you a little less than the street price of the controller. Without the enclosure. Thanks so much for the wonderful walk-through of the “fundamentals.” I’ve spent my entire Easter Sunday enjoying exploring what for me is a new subject (and musical genre, for that matter — controllerism). I’m hoping to build myself a little controller using the UMC32 (hope I got the model right). It’ll be an ambitious undertaking for me, as I’m extremely mechanically disinclined! Your primer was the best appeal to noobs like myself that I found today. I really appreciate your time. Thanks for the kind words, Ben! The UMC32 is a great little Brain. It's been recently upgraded to a "plus" model that works just as well. awesome article, really enjoy reading it considering that I’m planning to make my own MIDI controller. One question though, is it legal to make a MIDI controller using one of the brain that you mentioned and then sell that finished product? Or are those brains intended to be used as a personal device only? If you're going for commercial re-sale, be wary of the MIDIBox platform. They tend to ostracize people who try to make any money using their tech. There have been exceptions, but they were borne from months/years of building trust on their forums. You could argue this is what the Brains were expressly built for. "OEM" relationships are defined by someone paying an "Original Equipment Manufacturer" for the right to re-use their technology in their own creations for sale. That's how the Doepfer folks define their Brains. Hope that helps! No definitive answers above, but I'd encourage you to go ahead without sweating the legalities TOO much. If you’re considering Arduino as a DIY option, you’ll find some new innovations to “flash” it to operate just like a traditional MIDI interface. This is a new development — previously you needed to employ annoying “wrappers” and “loopback interfaces” to get an Arduino to speak MIDI. Rad article dude, thanks for collating these resources into a single article. Could you expound a bit into the why you think the different boards cost different amounts? Obviously there are physical interface differences, boards with headers and pins, but could you give your personal perspective on the difference in value as relates to a curious, newbie builder? How much more “solder-n-play” are the more expensive boards, versus an Arduino w/ a midi shield, for instance? Given your last comment about Arduino, (and the multitude of midi arduino projects out there) I’m guessing it wouldn’t be too much of a hassle to get the arduino to behave like a MIDI-builder wants it to. On the other hand, I’m really here for the music, and I view software programming as a necessary time expense, but not a pleasure, the way physical building/modding/hacking is. I believe the value proposition is based on three things: Economies of Scale, Feature Set and Usability. Economies of Scale are self-explanatory. For example, Arduinos are plentiful and cheap because they've been co-opted by a larger DIY movement. Features can be broken into two simple categories: amount of input/output capability and native USB compatibility. Usability relates to the amount of effort required to get the board working with a single sensor. Based on the above, I think the market has balanced itself pretty well. There are some price anomalies, but most of those parts are from the pre-USB>MIDI generation. To put it simply for "curious, newbie builders:" if you want the scope of your DIY project to be "how do I wire this knob to the board?," you should spend more than $70 on your MIDI brain. If you want to expand the scope of your project to include programming of the board, you can get away with spending much less. "Amount of Hassle" is difficult to quantify for a general audience. It all depends on the amount of value you put on your free time. Thanks for your thoughtful reply to a difficult question. Would you say that Livid and Hale have firmware programming interfaces that basically allow you to wire up any kind of input, within the specs of the brain, and then just assign where you want those values to go in the midi world, via their point and click GUI’s? Yes, that's exactly how they work, and exactly why they carry a price premium. The Highly Liquid board is quite versatile as well, provided you become familiar with creating SysEx strings. From what I've seen in the forums, John from Highly Liquid appears to be very helpful in creating these. Hi, great article. I just want to ask. If I want to control my DAW program with hardware knobs do I have to make MIDI device or it would work with just A/D converter? That MIDI brain is very expensive. And if it would work do you have some tips to build it? Thanks for your answer.